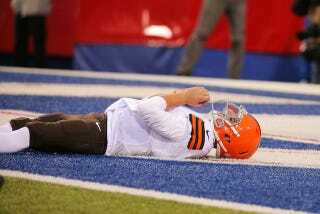 According to reports from NFL insider the 7-5 Browns are not going to start Johnny Manziel on Sunday against the Colts, despite the fact that Manziel played well after replacing struggling starter Brian Hoyer during last week's game against the Bills. After last week's game, head coach Mike Pettine sure sounded like he was ready to hand the offense over to Manziel, which was exciting news for everyone in America not named Brian Hoyer. Something clearly changed Pettine's mind, though, and so we all have to go back to waiting to see what Johnny Football can really do.